The Kawasaki Ki-61 Hien (飛燕, “flying swallow”) is a Japanese World War II fighter aircraft used by the Imperial Japanese Army Air Service. 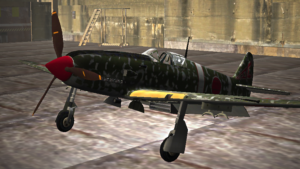 The Japanese Army designation was “Army Type 3 Fighter” (三式戦闘機). Allied pilots initially believed Ki-61s were Messerschmitt Bf 109s and later an Italian aircraft, which led to the Allied reporting name of “Tony“, assigned by the United States War Department. It was the only mass-produced Japanese fighter of the war to use a liquid-cooled inline V engine. Over 3,000 Ki-61s were produced. Initial prototypes saw action over Yokohama during the Doolittle Raid on 18 April 1942, and continued to fly combat missions throughout the war.